BARBARA. On March 15, at Mater Dei Hospital, MARIA CONCETTA of Żabbar, aged 92, passed away peacefully comforted by the rites of Holy Church. She leaves to mourn her loss her sisters Carmen, widow of Vince, Anne, widow of Tony, her brother Tony and his wife Phyllis, her nephews and nieces, relatives and friends. The funeral leaves Mater Dei Hospital on Wednesday, March 20, at 2.45pm, for the Sanctuary of Our Lady of Grace, Żabbar, where Mass præsente cadavere will be said at 3.30pm, followed by interment in the family grave at Żabbar cemetery. No flowers by request but donations to Radju Marija, Rabat, will be greatly appreciated. Lord, grant her eternal rest. DINGLI. On March 17, at St Peter’s Home in Lija, CARMENA widow of Joseph Dingli, of Lija, aged 87, passed away peacefully, comforted by the rites of Holy Church. She leaves to mourn her loss her brother Mgr Alfred Xuereb and her sister Maria, nephews and nieces, relatives of her late husband Joseph Dingli and friends. The funeral leaves St Peter’s Home tomorrow, Tuesday, March 19, for Our Saviour parish church, Lija, where Mass praesente cadavere will be said at 3pm followed by interment in the family grave at the Lija cemetery. No flowers by request but donations to id-Dar tal-Kleru would be greatly appreciated. Lord, grant her eternal rest. STEVENS. 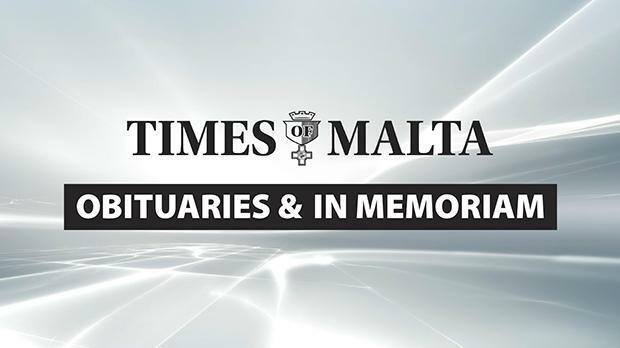 On March 17, at Sir Anthony Mamo Oncology Centre, HUGH of Paola, residing in Birkirkara, former teacher at Marsa primary school, aged 75, passed away peacefully comforted by the rites of Holy Church. He leaves to mourn his loss his wife Catherine, his daughter Elaine and her husband Kenneth Barbara, his son Karl and his partner Kim, his beloved grandsons Matthew and Andrew, his brothers and his sister, in-laws, their respective spouses, nephews and nieces, relatives and friends. The funeral leaves Mater Dei Hospital tomorrow, Tuesday, March 19, at 9.30am, for St Helen’s Basilica, Birkirkara, where Mass præsente cadavere will be said at 10am, followed by interment in the family grave at Santa Maria Addolorata Cemetery. No flowers by request but donations to Hospice Malta, Balzan, will be greatly appreciated. Lord, grant him eternal rest. VELLA. On March 17, MICHELINA, aged 92, passed away peacefully at home comforted by the rites of Holy Church. She leaves to mourn her great loss her children Tony and his wife Josephine, Cettina Zahra and her husband Vince, Irene, John and his wife Angele, her beloved grandchildren Ingrid and her husband Adrian Camilleri, Mark and his fiancee Eva, Sarah and her husband Carlos Tabone, Francesca and her fiance Antonio, her brother Frans Azzopardi and his wife Agnes, her sister Amelia, nieces, nephews, relatives and friends. Funeral Mass praesente cadavere will be said tomorrow, Tuesday, March 19, at 3.30pm at Siġġiewi parish church, followed by interment at Siġġiewi cemetery. Lord, grant her eternal rest. Friday, March 22, being the trigesima die since the demise of ISABEL GERA, a Mass for the repose of her soul will be said at 6.30pm at St Patrick’s church, Sliema. LOFARO – IRIS, née Nunns. In everlasting memory of a beloved sister, mother, grandmother and aunt, today being the anniversary of her meeting with the Lord. Doris and Winston, her daughter Christine, her son Ian and her grandchildren Andrew and Penelopy living in Australia, her nephews and nieces. Always and forever missed. May she rest in peace. MARICH – LENA. Treasured memories of a dearest mother and grandmother, today being the 25th anniversary of her demise. Always in our hearts, thoughts and prayers. So sadly missed by her daughters Doreen, Caroline and Louise, her sons-in-law and grandchildren. PULIS. In loving memory of JOSEPH, a beloved father and grandfather, today the 19th anniversary of his meeting with the Lord. To live on in the hearts of those we love is not to die. Dear Lord, grant him eternal rest. Yvonne, Josette, Alex and families. SALOMONE. In loving memory of CATHERINE (Kitty), a beloved mother and grandmother, on the 29th anniversary of her demise. Deeply missed and never forgotten by her children Mary and Jeffrey Scorey, John and Mona, Carmen and Tony Pulis, and their families. Sacred Heart of Jesus, keep her in Your care.